Availability of sufficient space is always the biggest problem for any city dweller. Your apartment never comes with a big backyard. This space crisis can be pretty saddening if you are passionate about gardening. But don’t let this problem stop you. Utilize whatever minimum space you can manage and turn it into a bright, colorful garden and what better space than your apartment balcony. Here are a few ideas that can make your balcony a perfect gardening spot. Before you start planting in heavy planter pots, make sure that your balcony is strong enough to hold your garden. To avoid any legal problems, it is advisable that you talk to your landlord and seek permission before you start doing something big. You cannot grow all kinds of plant in your balcony. There are some plants specific to a balcony garden. Go to your local nursery to know in details about balcony plants. Climate also plays a huge factor. So before buying a plant make sure that it is suitable enough to grow in your climate. You need to have detailed information about all the plants you are growing in your balcony garden. Many apartments don’t come with a big balcony. Balconies can be really small and congested in many cases. Vertical gardening will be your solution in such circumstances. You can make a vertical garden on your water pipes or make a shelve for your garden. Plant climbing flowering plants along the walls of your balcony. You can also go for mountable hanging gardens. Use your balcony railings and install hanging flower boxes along them. It will save you a lot of space. Do something creative with your balcony floor. To give it a more natural look to purchase an artificial green carpet or it will give your balcony a natural vibe. Before buying your planter pots, make sure they are not plain and simple. 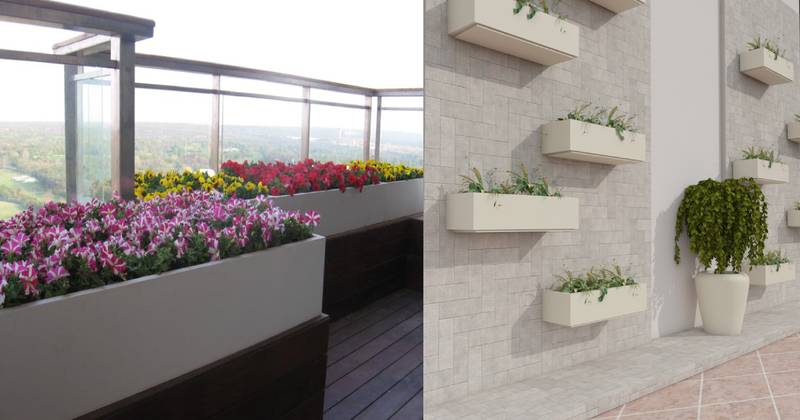 You can check few of Yuccabe Italia's railing planters, specialized designed for your balcony. Go for decorative and colorful That will automatically make your garden look brighter. You can add statues or colorful lantern too in your balcony garden. Add some furniture in your balcony garden. A sofa or two or a wooden chair and table will be a perfect inclusion to your balcony garden. So sit back and relax enjoying the view. Make sure there is adequate lighting in your balcony garden. It is better to install some soft lights to give it a more soothing and a serene atmosphere. Grow some night and scented flowers like night jasmine, queen of the night, cape jasmine etc. you can always use your balcony for a date night. What can be more romantic than a night spends amidst the flowers? Take proper care of your balcony plants. It can sometimes be a problem to store your gardening equipment. Just use them as decorators in your garden. Buy a decorative shelf and keep your equipment there. Or you can get an old ladder, design it the way you like and install it in your garden to store your gardening equipment. These balcony planters ideas are surely going to help you a lot in making your own balcony garden. Just boost up your creativity and make your balcony the prettiest garden with these ideas.